Rather than the government and police propaganda campaign, the main factor limiting the turnout was the lack of a clear lead from the main pro-democracy parties - the pan- democrats - who have been in full-scale political retreat since Lam came to power. A government press release said “chanting slogans which disrespect ‘one country’ and disregard the constitutional order, or which are sensational and misleading, are not in line with Hong Kong’s overall interests and would undermine its development.” In particular the government is stepping up pressure against the slogan “End one-party dictatorship!”. They are lining up to force opposition election candidates to disavow this slogan or be banned from standing. This propaganda does not much affect the mood of ordinary workers and youth whose anger is growing, but it can terrify the ‘moderate’ pan- democrats who are anyway uncomfortable with the concept of mass struggle and want to avoid a fight with the government at any cost. The Umbrella Revolution of 2014 saw 1.2 million take part in rallies, occupations and anti-government protests during a record 79-day standoff. This movement was the biggest political challenge to the Chinese dictatorship, now under absolute ruler Xi Jinping, since the mass movement of 1989. 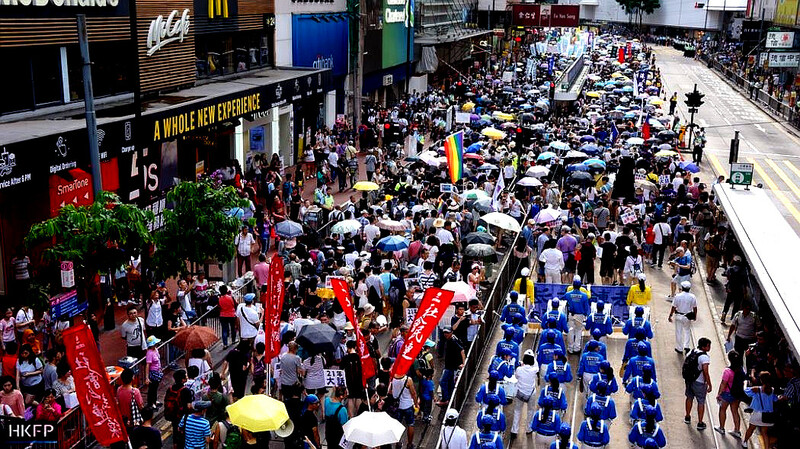 The government’s repressive measures today are an attempt to prevent any repetition, but this is ultimately doomed to fail especially when political developments in China catch up with and, quite possibly, surpass those in Hong Kong. Socialist Action ran stalls along the route of the ‘7.1’ demonstration with the new issue of the ‘Socialist’ (社會主義者) magazine.